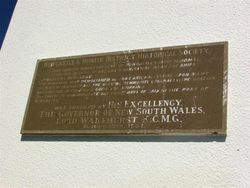 The Obelisk tablet commorates the early days of sailing in the port of Newcastle and details the historical background of the structure. 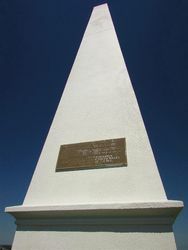 The obelisk was erected in 1850 as a guide to shipping. The Governor, this afternoon, officially opened the civic improvements at the Obelisk and unveiled on the Obelisk a commemorative tablet which was formerly used as a guide to mariners. Alderman Goold said " The Newcastle and Hunter District Historical Society, desirous of commemorating the early days of sail in the Port of Newcastle, and of those hardy mariners who braved the storms and gales in their tiny vessels, have placed a tablet on the Obelisk." The Newcastle Sun (NSW), 17 August 1937. 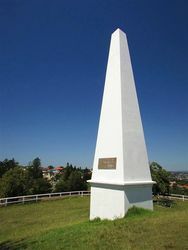 THIS OBELISK MARKS THE SITE OF NEWCASTLE'S FIRST WINDMILL.